If you have been looking for something special with a good location for your holiday you can stop looking, for this apartment is for you. From the living room you have an open view on the balcony and out to the sea. At the far end of the apartment there is a sleeping alcove with a double bed. If you need more bed space, the sofa in the living room can easily be converted into a double bed. If you want to stay as close as you can at the beach this is the apartment for you. The apartment is very well planned with a balcony to the sea. 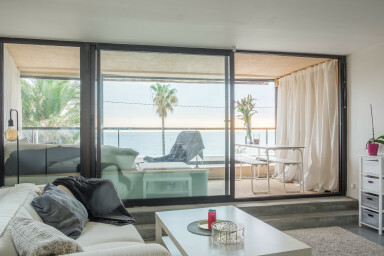 From the living room you have a glass wall facing the balcony which gives a panoramic view over Plage du Midi, the Mediterranean and the Esterel Mountains. In the evenings you can sit on the couch outside on the balcony and enjoy the sunset over the Esterel Mountains. In the morning you have the sunrise to the east. The living room has a fully equipped kitchen with everything you could need, including a dishwasher and washing machine. The apartment was beautiful and Anders was very good and quick in terms communication. Highly recommended!